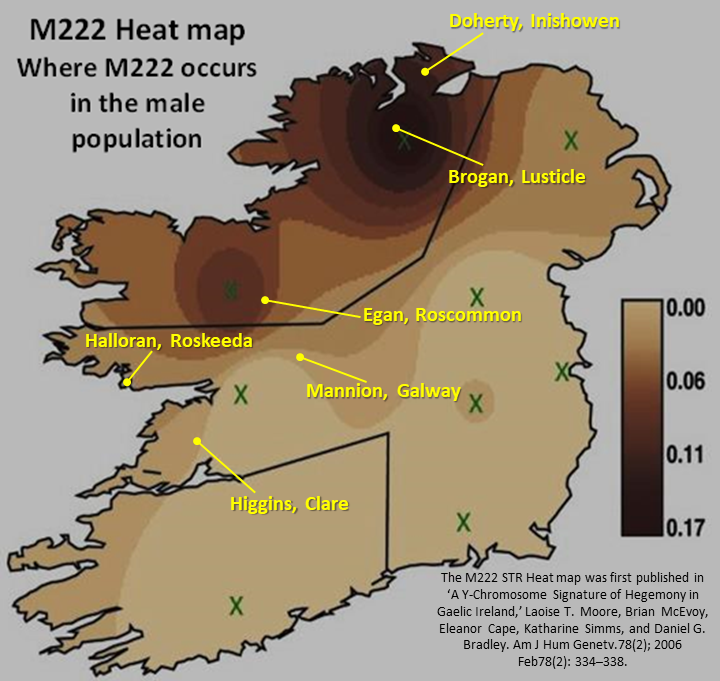 Clan Doherty dominates both the genetic matches of M-222 males and the Inishowen peninsula (where the Doherty surname occurs among 10% of all males that live there). Inishowen lies close to the area where R-M222 reaches its highest concentration among males in Ireland. 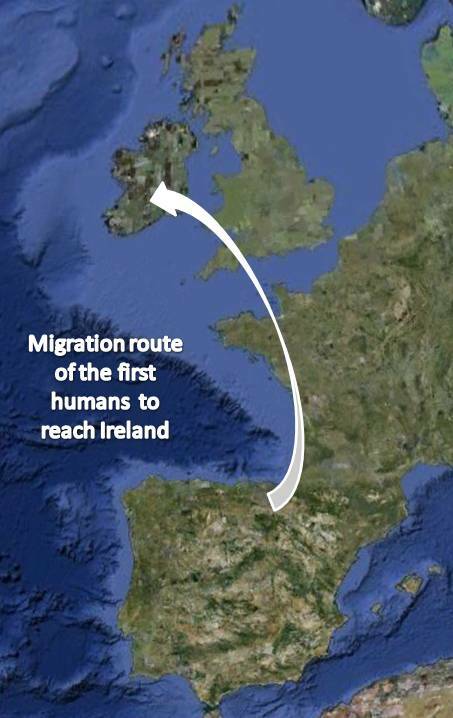 Hence, by taking the Y-DNA67 STR marker results of a confirmed R-M222 Doherty male as a baseline (one picked at random, but with ancestral links with Inishowen), one can explore the genetic distance between the baseline-Doherty and other R-M222 males (who record ancestral links with other parts of Ireland) to determine when their shared Inishowen paternal ancestor lived. Using the Scottish Origenes timetable (click here) the earliest shared Inishowen ancestor (between Doherty and Egan. 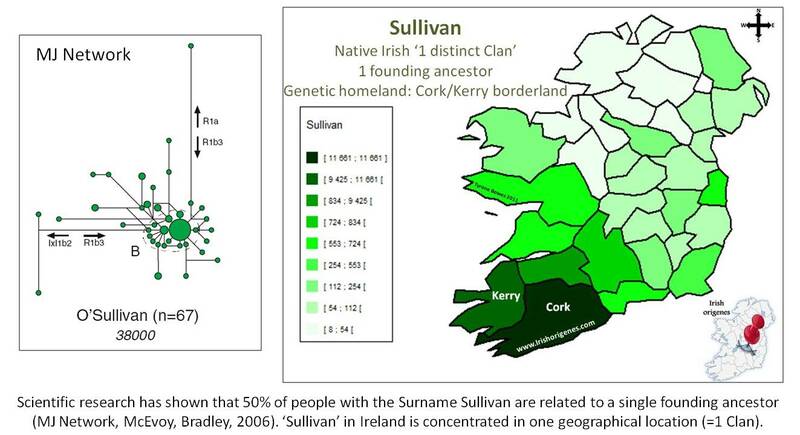 see accompanying table) lived in around 500AD, which surprisingly, is a good match for the reported prehistoric founding ancestor of the O’Dohertys named ‘Conall Gulban’ who apparently died in 464AD. ‘Conall Gulban’ was in turn the reported son of ‘Niall Noigiallach’ (from whom the R-M222 ‘Niall of the Nine Hostages’ takes its name). Note: I would take Gaelic dynastic lineage data with massive amounts of salt (as a rule the more notable the Clan, the more fanciful and extravagant the purported dynastic origin). In summary, the R-M222-Adam (the first male in whom the R-M222 mutation appeared) lived approximately 1,500 years ago (500AD). He lived on (or near) the Inishowen peninsula in Northwest Ireland. His descendants proliferated (dynastic privilege perhaps?) and would later spread through the midlands, west and north of Ireland, then later through Southwest Scotland and eventually all over the world. I myself have tested to 67 markers, I am R1b with ancestral links with the Irish Midlands, but I don’t fall within the R-M222 grouping. When I compare my matches to the ‘baseline’ Doherty; the genetic distance is 29 STR markers (out of 67); which corresponds to a shared paternal ancestor with the Dohertys almost 3,000 years ago. That would indicate that our shared paternal ancestor was a member of a Celtic tribe that lived in Central Europe (if we all go back far enough we will all eventually shared an ancestor). But what about others who have Y-DNA tested and whose initial results indicated an R-M222 origin? In 2012 I recruited an Englishman named ‘Nick Taylor’ for a Y-DNA study. When his results came in we were surprised to say the least; we received the following email ‘Your haplogroup has been predicted to be R1b and your first 12 markers match the “Niall of the Nine Hostages” haplotype.’ Taylor is not a surname associated with pre-Norman Gaelic Ireland, and analysis of Mr Taylor’s closest Y-DNA matches (aee attached image) revealed that Nick’s founding Taylor ancestor was living in Somerset in Southwest England approximately 1,000 years ago (the English Southwest is however a Celtic Y-DNA hotspot). When I align Mr Taylor’s YDNA 37 (Nick has only tested to 37 markers) with the baseline Doherty the difference is a whopping 15 markers, which (using the 37 marker timetable here) corresponds to a common Celtic ancestor approximately 3,000 years ago in Central Europe. So how has the pseudo-M222 labelling of Mr Taylor occurred? 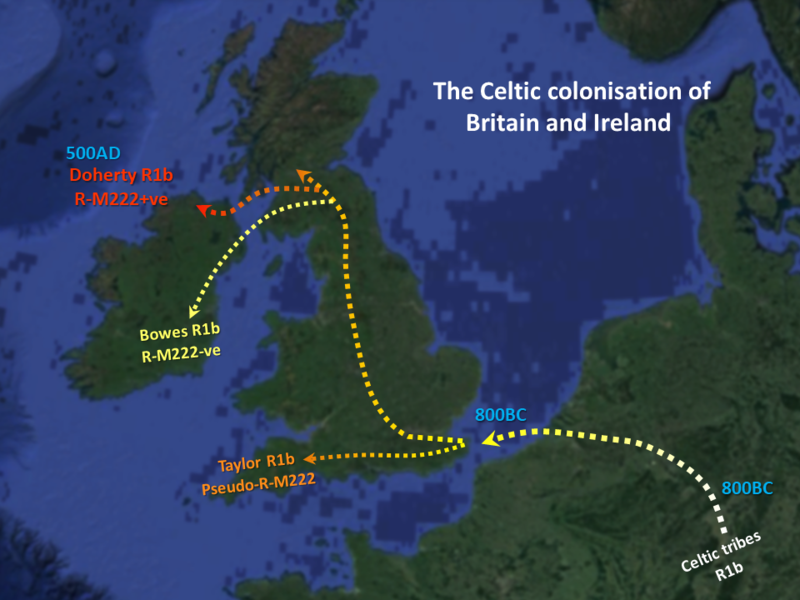 The majority of British and Irish males are descended from the Celtic tribes that arrived in these islands in waves from about 800BC onwards, and as such they will share many STR genetic markers (which unlike SNPs are far more susceptible to amplification or deletion). BUT, if you share 50 or more of the 67 FTDNA YDNA STR markers (or 25 or more at the 37 marker level) with a baseline R-M222 Inishowen Doherty then you are almost certainly descended from the R-M222 Inishowen-Adam (whether it really was ’Conall Gulban’ we will never know). In Nick Taylor’s case his first 12 markers were similar to R-M222 and merely reflected their common Celtic origin. If you think you may have an R-M222 origin then you can align your Y-DNA STR markers with an Inishowen Doherty using the Ysearch comparison tool here. Or simply contact Irish Origenes by clicking here for a FREE CONSULTATION. Remember folks, I am a trained scientist; many online DNA bloggers have no formal scientific training, and have never worked in a scientific research lab. Always research the person writing that DNA blog (sometimes a purely honorary title can go to one’s head! ).